Although placed on the right, this engraved ‘frontispiece’, so termed by Robert Burton (1577-1640) himself, depicts a wealth of symbolic information on his classic ‘melancholy’ text. First published in 1621, Anatomy was written to get Burton out of a bout of depression. The work also contained a poem explaining the ‘frontispiece’, which was engraved by Christian Le Blon. The engraver must have known Burton’s intricate text well, because each of the ten panels depict symbols and emblems that relate closely to the content. 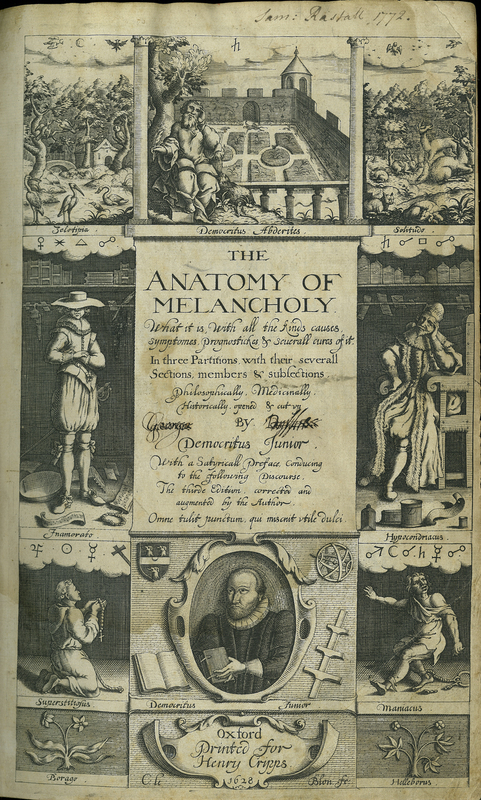 Robert Burton, “The Anatomy of Melancholy,” ourheritage.ac.nz | OUR Heritage, accessed April 24, 2019, http://ourheritage.ac.nz/items/show/10676.